Pots in the garden landscape can create pleasing effects in a variety of ways. They can provide extra colour or focus to a garden, they can extend garden space into living areas making the boundary between inside and outside less distinct. They can reflect surrounding vegetation, and make allusions to nature through careful use of particular plants such as bonsai. Choose the style and colour of your pots to suit both your plants and the style of garden. In most cases, look for contrasts between the pot colour and the flowers or foliage. Either choose a pot with a neutral or subdued colour to display bright flowers or foliage, or a bright coloured pot to display green foliage. Think carefully about using very colourful pots containing very colourful plants. Be careful not to choose pots that compete. Terra cotta has a natural warm colour that teams well with all plant colours, but its absorbent nature means that it soaks up water and the potting mix can quickly dry out. Other problems are caused by algae and discolouration from salts leaching to the surface. Glazed ceramic pots have a very decorative shiny, smooth texture that is great for showing off plants. Depending on your preference, the pots may be plain or patterned, in single or multi colours. 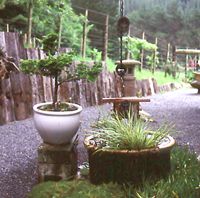 Concrete pots are long-lasting, sturdy and weatherproof. They can be painted in bright colours to improve their appearance but they may need to repainted every year or two as the colours may fade or the paint may peel and crack. When you set up your pot display, think of the surrounds, especially the colour and texture of the ground surface and backdrop. Look for backgrounds that complement or contrast with the pot colour. Also consider changing light conditions throughout the day and how this might affect the visual impact of the pot. A dark coloured pot can look dramatic when it’s in full sunlight, but will appear drab if it remains in shade for most of the day. Don’t group too many different coloured pots together – the effect will be probably be jumbled and unattractive. Using one or two colours in a repeated pattern (eg. matching coloured pots evenly spaced along the edge of a patio) will give a more pleasing design. · A single colourful pot or a cluster of empty pots can be used to hold dried or fresh flowers on a verandah or indoors. If using fresh flowers, place the flowers in a container filled with water (such as a jar or plastic soft drink bottle) and sit it inside the decorative pot. · Large pots can be turned upside down with a plank on top to make a bench. · Large tubs can be used as a water feature. Choose a tub without drainage holes and place a rubber liner inside to prevent water leaking. Tulips are members of the Liliaceae family. Common garden tulips have been developed over three centuries of breeding, predominantly from the species "Tulipa gesneriana".